91. How To Start A Startup: Competition Is For Losers; Aim For Monopoly – How to Shape Human Behavior. 00:00:41 If you’re starting a company, ALWAYS aim for monopoly and avoid competition; hence, competition is for losers. 00:01:16 Capturing value: A business creates X dollars of value and captures Y% of X. X and Y are independent variables. Measured solely by the size if the industry, you can obviously see that the airline industry is much more important than search. 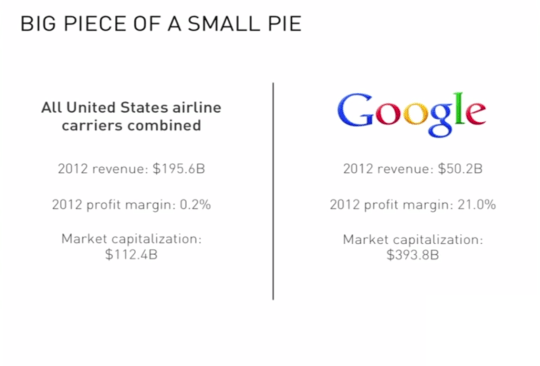 But consider that the airline industry is fraught with many competitors who are constantly going in and out of bankruptcy with only a few players remaining long-term, and then considering Google’s profit margins in its market and resulting market capitalization and you can plainly see the value in not having competitors. 00:03:52 There are pros and cons to perfect competition – namely that business models and the industry are easy to model after and politically what people are told that competition is ‘good’ for society; however this is unfavorable if your industry is hyper-competitive because in such an environment you often can’t make much money, psychologically unhealthy. 00:04:35 There are pros and cons to a monopoly – namely that they tend to be much more stable and long-term business with more capital and innovation above and beyond anyone else even closely related to your industry; however this is unfavorable because with no competition there will be lower output with higher prices and innovation may be stifled as the monopoly-holding company actively seeks to prevent other companies from entering their market and stealing market share. 00:05:05 There are thus essentially two kinds of businesses in this world: businesses that are perfectly competitive, and there are businesses that are monopolies. This dichotomy is quite often understood because people are constantly lying about the nature of the business that they are in. 00:05:55 Companies who have monopolies in an industry will claim to be in a huge market and pretend to be against incredible competition so as to avoid government regulation and scrutiny. Hollywood example: “A college football star joins an elite group of hackers to catch the shark that killed his friend.” Is this a really good idea for a movie, or is this just another Hollywood movie? 00:09:40 So startups follow suite by combining all the intersections of all the currently popular buzzwords into one business model and story to create ‘the next promising’ startup. 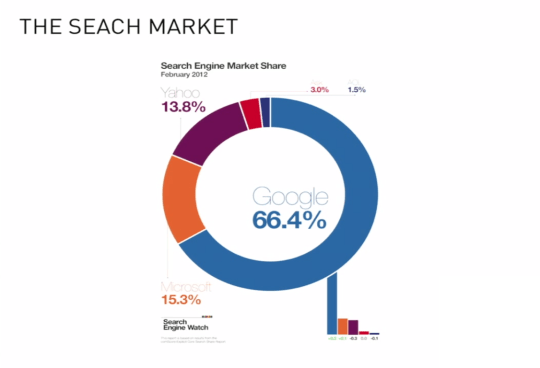 00:10:50 Google, on the other hand, monopolizing over 66% of the Search Engine market, will go so far as to describe itself as being in the ‘advertising’ market or the ‘technology’ market to avoid being discovered as a monopoly in the search engine industry. 00:13:48 Start small and monopolize one individual market that is so small that established brands consider you too insignificant to bother with and then you expand; it’s easier to dominate a small market than it is a large one. A big mistake is going after a giant market from day one. If you think your initial market might be too big, it almost certainly is, there will be too much competition, and you need to better hone your categories. Being a minnow in a vast ocean of fish is not a good place to be. Aim for walk-in and brand recognition in a small market and among a small group of consumers. Proprietary information – you want to have some sort of very powerful order-of-magnitude improvement in some key dimension over everyone else in the market. A totally new creation would be ideal – an infinite improvement on existing solutions. Network effects – although everyone understands how valuable they are, they are very hard to get started. 00:22:56 It’s not enough to have a monopoly for just a moment; the critical thing is to have one that lasts over time. 00:23:00 First mover’s advantage can be valuable, but a better framing is you want to have the last mover’s advantage – the last company in a category. Consider that Microsoft was the last operating system – at least for many decades. Google is the last search engine, Facebook will be valuable it it turns out to be the last social networking site. Most of the value in these last mover companies exists in the future: estimated cash flows of upwards of 85% ten years in the future and beyond. So yes, the first move does give you a slight advantage, but it is the last move that wins. 00:29:00 Consider the innovators in the past few centures – scientific innovation especially, many of them made discoveries that changed the world and billions of people benefited from, however they themselves didn’t make any from it. So don’t think that you live in a just world where you will be rewarded for your work and your inventions. 00:33:00 We live in a culture today where it is extremely difficult to convince people to buy into something that is super complicated and takes very long to build. 00:35:10 There are different sorts of rationalizations people give of why certain things work and why certain things don’t work, and these rationalizations almost always obscure the idea that you’re creating X dolars in capital value and Y% of X. So is it truly that scientists are all acting only out of the hope for the betterment of mankind and don’t care at all about making money or capturing a certain percentage of the business market, or do we rationalize this because those scientists do not capture any percentage of the market and make almost no money for their hard work? Likewise, because software today seems to be capturing so much money and market share in the world, we wrongly rationalize that software and technology must be the most important thing in the world; full stop. 00:37:20 We always tend to think of the losers as people who are not good at competing, the slow ones on the playing field or who score less on the standardized tests or who don’t get into the right schools. 00:38:37 Humans tend to be attracted to competition as a form of validation where we go for things that lots of other people are going for. But it’s not that there is wisdom in crowds; it’s not when people are all trying to do something that that’s proof of being valuable. It’s when lots of people that are trying to do something that is often proof of insanity. 00:40:15 When it’s really hard to differenciate yourself from other people, when the objective differences really are small, then you have to compete ferociously to maintain a difference of one sort or another that’s often more imaginary than real. 00:41:32 Competition does make you better at whatever it is that you’re competiting on because you’re comparing yourself to other people around you and figuring out how you can be better than your peers, but beware of having your personality get so wrapped up in competiting for and winning the competition that you forget your initial objective for entering the tournament in the first place. 00:42:50 Focus on the actual story of the market – the real objective market, because brands and advertisers can always tell a fictional story about the market they’re in, and have real and powerful incentives to do so. Posted on April 7, 2015 February 13, 2017 by Joshua SMITHPosted in videosTagged angel investors, competitive advantage, entrepreneurs, formation, france, paris, paypal, peter thiel, Stanford University, startups, videos, ycombinator, youtube.